The balloons have 5 subclasses officially, but the hot air balloons could be many shapes. The traditional is the drop shaped balloon but balloons are created in a special shapes too. These special shaped balloons participate in air-shows usually. These are more complicated to handle and these have completely different flying features than a racing balloons. 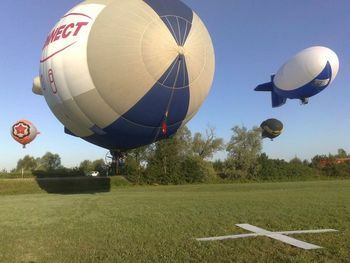 The competitor pilots prefer the drop shaped balloons and they are used between the category AX-6 and AX-8. The hot air balloons could be operable in the most economical way. The gas balloon costs are much more money because they are using gas (helium). (This is the type of balloon where sandbags are used as ballast. Many times the hot air balloons are illustrated with sandbags – for examples in commercials or on drawings – but in fact it is never used.) 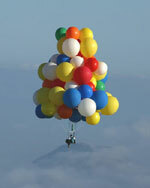 The most expensive balloon is the Rozier balloons, it is a mixed type balloon which is using gas and hot air, as well. 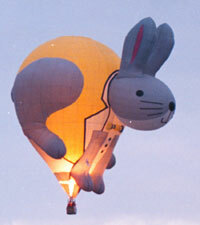 This kind of balloon is used for long-distance flying. This kind of balloon was the winner of Around the World Flight. The human invention is inexhaustible. An aircrafts pilot met with a man who was sitting on a garden-chair and it lifted up by helium filled balloons on more thousands meters high. The airships have 4 subclasses and these could be ranged into the balloons if we interpret in a wider way. The Zeppelins are most known which was filled by hydrogen firstly, then later by helium which is more safety. The hot-air airships are lesser-known. These are lifted by the hot air as the hot air balloons. The most important difference is between the airships and the balloons, than the airships can change the horizontal movement by engine. It is also possible to occasionally ride in one of the balloons. The Hungarian balloons are the traditional shape but there are some special shaped too. We have a gas balloon too, which is not a free balloon. This is using for lift up the people to give them a scenic view. We had some airships. These were hot-air airships and one of them participated in competitions too.